Messier 98 (M98) is an intermediate spiral galaxy located in the Virgo Cluster, in the constellation Coma Berenices. The galaxy has an apparent magnitude of 11.0 and lies at an approximate distance of 44.4 million light years from Earth. 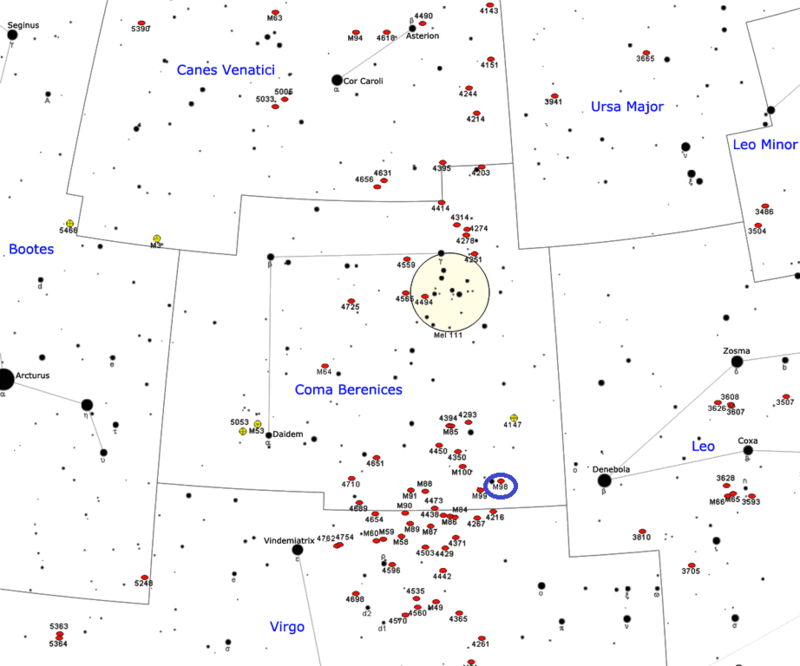 Its designation in the New General Catalogue is NGC 4192. M98 occupies an area of 9.8 by 2.8 arc minutes of apparent sky, which corresponds to a linear diameter of 160,000 light years. The galaxy is inclined at a 74-degree angle to our line of sight and appears almost edge-on. It is one of the faintest objects in the Messier Catalogue and, having a low surface brightness, one of the most difficult Messier objects to observe. M98 requires exceptionally clear, dark skies and at least a 4-inch telescope. 8-inch telescopes reveal a thin, hazy streak of light with a slightly brighter centre, while larger amateur telescopes show the nucleus more clearly. 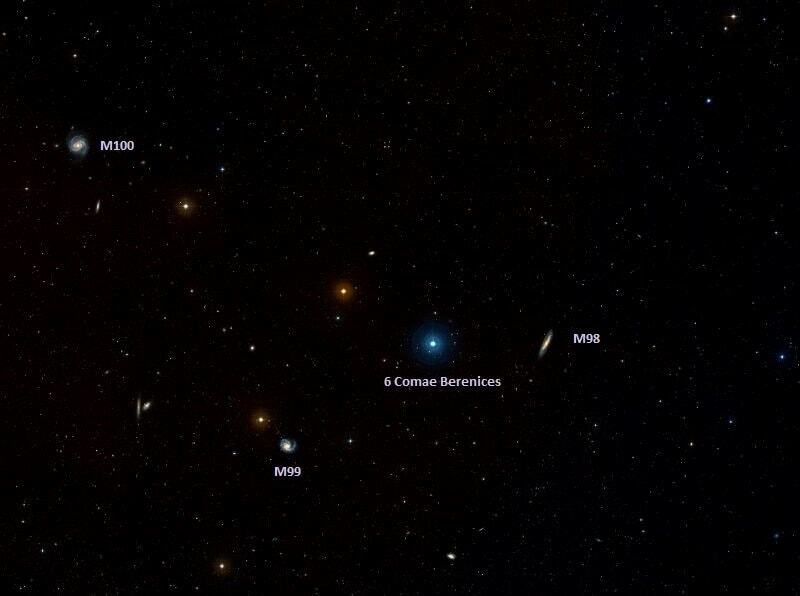 Messier 98 can be found about 6 degrees east of the bright star Denebola in the constellation Leo and only 0.5 degrees west of the 5th magnitude star 6 Comae Berenices. The galaxies Messier 99 and Messier 100, located in the vicinity of M98, are both brighter and easier to see. The best time of year to observe the galaxies is during the spring. The classification SAB(s)ab indicates that M98 is a spiral galaxy with mixed barred and non-barred features and intermediate to tightly wound spiral arms, with no ring. The galaxy has a rotation velocity of up to 236 km/s and is approaching us at 142 km/s. It is one of the most remote blueshifted large galaxies. Messier 98 is estimated to contain about a trillion stars. The stars in the galaxy have a total mass of 76 billion solar masses. M98 also contains about 4.3 billion solar masses of neutral hydrogen gas and 85 million solar masses of interstellar dust. The nucleus of M98 is active, exhibiting LINER-type (low ionization nuclear emission region) characteristics, and surrounded by an H II region. The light of the nucleus is obscured by a large amount of dust in the galaxy’s disturbed, elongated disk, which also contains numerous star forming regions. The dust was produced during tidal collisions and interactions with neighbouring galaxies. 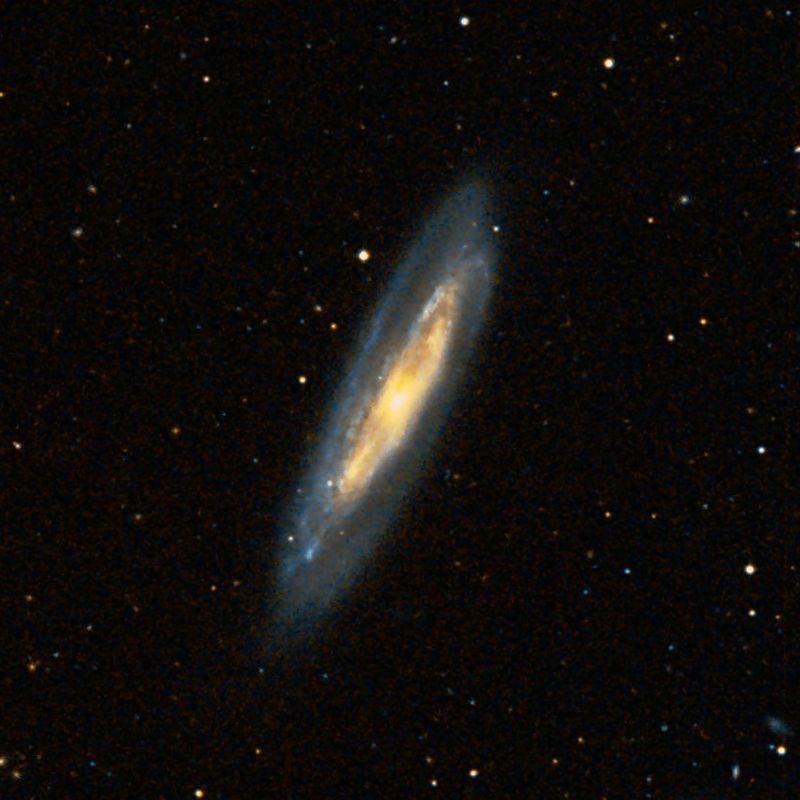 Messier 98 may have had an encounter with the spiral galaxy NGC 4254 about 750 million years ago. The galaxies are now separated by about 1.3 million light years. The dark galaxy candidate Virgo HI21 is suspected to be made out of material that was ejected from NGC 4254 during the galaxy’s high velocity encounters with M98. Messier 98 was discovered by the French astronomer Pierre Méchain on March 15, 1781, along with the unbarred spiral Messier 99 and the grand design spiral galaxy Messier 100. Both these galaxies are located in the same region of the sky. Nebula without star, of an extremely faint light, above the northern wing of Virgo, on the parallel & near to the star no. 6, fifth magnitude, of Coma Berenices, according to Flamsteed. M. Méchain saw it on Mar 15, 1781. A large, extended fine nebula. Its situation shows it to be M. Messier’s 98th; but from its description it appears, that that gentleman has not seen the whole of it, for its feeble branches extend above a quarter of a degree, or which no notice is taken. Near the middle of it are a few stars visible, and more suspected. My field of view will not quite take in the whole nebula. A fine and large, but rather pale nebula, between Virgo‘s left wing and Leo‘s tail; with the bright star, 6 Comae Berenices, following [east] in the next field exactly on the parallel. M. [Messier], who discovered it in 1781, merely registered it as “a nebula without a star, with an extremely faint light;” but on keeping a fixed gaze it brightens up towards the centre. It is elongated, in the direction of two stars, the one np [noth preceding, NW] and the other sf [south following, SE] of the object; with another star in the nf [north following, NE] quadrant pretty close. Differentiated with Beta Leonis, which star it follows by 6deg 1/2 in the direction of Arcturus; it lies on the outskirts of the vast region of nebulae that adorns the Virgin‘s wing. An open, elongated spiral 8’x2′ in p.a. 150deg. Bright stellar nucleus; numerous almost stellar condensations. Absorption effects on east side.